Ross installs LED lighting in the restrooms at Fairview Alpha Elementary School. The school board tabled closing Cloutierville Elementary/Jr. High during its meeting Thursday. 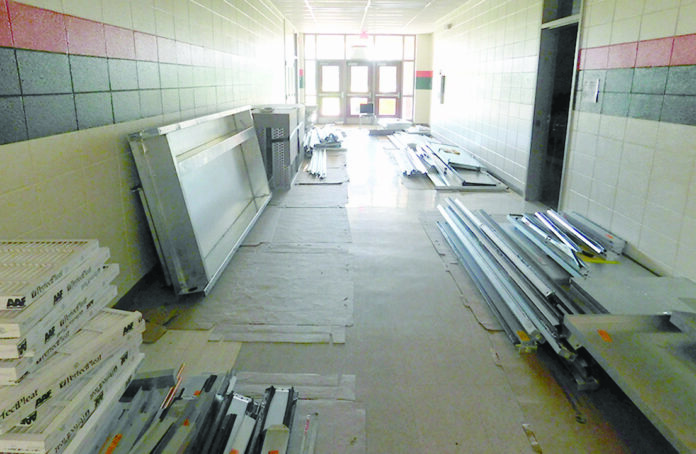 The board scheduled a visit to the school Monday at 10 a.m. There will be a special called meeting Thursday, June 14 at the school board central office at 5 p.m. to further discuss the issue. At the school board committee meeting Tuesday, Supt. Dale Skinner termed the closing a cost-cutting measure saying it would save the system $1.4 million annually. The enrollment at Cloutierville last year was 206-210. That included students who were bussed from Town South and Pan Am. In the fall, those students will return to City schools. That will drop the enrollment to approximately 93 students. The faculty numbered approximately 16 last year. Skinner said he had examined a four-day school week but believed it would be unsuccessful as it has been in Beauregard Parish. He said Tuesday that should the school close, the teachers would return to city schools or to vacancies elsewhere. That will allow those schools to maintain optimum class size. Director of Curriculum and Instruction Susan Horne told the board the additional teachers will provide relief at schools where some teachers have had no planning periods. Jeromy Porter installs a new LED EXIT sign in the FAE office. The men are employed by Camus Electric Co., the contractor for electrical renovations at Fairview, Lakeview and Goldonna schools. Another factor in Skinner’s recommendation is that public school enrollment is down nearly 600 students from 2010-11, resulting in less funding from the State. On Thursday, the board asked for a breakdown of declining enrollment at each parish school. The main objections came from board member Emile Metoyer who represents the Cloutierville district and questioned other expenses in the system. He spoke about what he said were extra administrators at L.P. Vaughn, mainly discipline coordinators, as well as two principals and two assistant principals. He said there had been no cuts to athletic programs. “Why are we closing rural schools?” Metoyer asked. A contract was signed with Sports Turf Specialists to “sprig” the football field at Lakeview instead of sodding it, for a savings of about $40,000. Coach Brandon Helms said the first game will be played at NSU in August but the field will be ready for the first home game Sept. 14. At the meeting Thursday, board member Stephen Harris said he believed Cloutierville was a sacrificial lamb. “Show me on paper (the savings) and stop fooling the people.” He advocated looking at other issues including staffing formulas. Board member Ralph Wilson was persistent and repetitious in asking that the board also visit other schools on Monday for a comprehensive evaluation of the system. He said the board needed to strategically plan for all schools. He then moved onto the next items. After the meeting, Hilton said he didn’t see spending $14,000 per student (MFP funding) just to keep the school open when it has low enrollment and the other schools are at capacity. It is the only school that has not been updated. “The central issue is savings,” Hilton said. •Contract with Sports Turf Specialists to “sprig” the football field at Lakeview instead of sodding it, for a savings of about $40,000. Coach Brandon Helms said the first game will be played at NSU in August but the field will be ready for the first home game Sept. 14.